BOSTON -- Boston police say they have arrested a 65-year-old man they believe is the infamous "Brighton Tree Ninja." Infamous, because for several years, someone has been periodically killing or damaging young trees that were planted in the Brighton section of the city, CBS Boston reported. 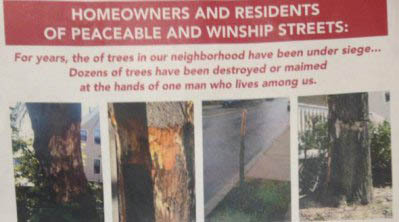 Flyers posted in the neighborhood have warned residents about the "master of evasion" who has cost the community thousands of dollars in tree removal spending, according to the station. "The tree killer has now moved on to damaging and destroying flowering shrubs and bushes. YOURS COULD BE NEXT," the poster reads. Over the past few weeks, detectives have been gathering video evidence. They set up surveillance in the area of the Brighton Elks Club to try and nab the culprit. According to CBS Boston, police say 65-year-old Joseph Rizza showed up on Wednesday and began attacking a tree. As detectives approached him, they say Rizza tried to hide a hammer he'd been using, but it was too late. The so-called tree ninja was hauled into court, and charged with five counts of willful and malicious destruction of property, the station reported. For now, it appears that once again a tree can grow in Brighton without having to live in fear. Police are continuing to investigate Rizza in connection with several years of similar incidents.